In this first of a four-part series on the health reform case before the Supreme Court, Jones & Bartlett Learning author and health policy expert Joel Teitelbaum weighs in on the topic of the Anti-Injunction Act. During the final week of March, the United States Supreme Court engaged in an historic debate about the meaning and constitutionality of the Patient Protection and Affordable Care Act (known as Affordable Care Act, or ACA). The debate was historic for several reasons: its content, focused as it was on perhaps the most sweeping health law in the nation’s history, and certainly of the past 50 years; its precedential importance, given that the Court is poised to make potentially enormous changes to Congress’s Commerce and Spending Clause powers; and its length, with oral arguments spanning a record three days. The Court agreed in November 2011 to hear oral arguments on a series of legal issues that arose as a result of nearly 30 legal challenges to the ACA since its passage in March 2010. Whether the ACA’s individual coverage requirement (also referred to as the individual mandate) is a tax for purposes of the Anti-Injunction Act. In this blog post, the first of a four-part series, I focus on the first question. The next post will focus on questions two and three, and the third blog post will discuss the question concerning the Medicaid expansion. In the final blog post, I will describe the Court’s eventual ruling in the case, which is expected by the end of June (when the current Supreme Court Term ends). The Anti-Injunction Act (AIA) is an 1867 federal statute that states “no suit for the purpose of restraining the assessment or collection of any tax shall be maintained in any court by any person, whether or not such person is the person against whom such tax was assessed.” Essentially, the law requires that a person resisting the assessment of a federal tax must first pay the full amount of tax assessed by the Internal Revenue Service before filing challenging the tax in an administrative hearing or in court. 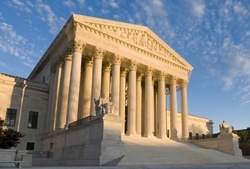 Because the ACA’s minimum coverage requirement is enforced through a penalty that is assessed under the tax code, the Court agreed to consider whether a challenge to the coverage requirement could be entertained by the courts before 2015, when the coverage requirement penalty will first be assessed. In other words, the Court will decide whether it yet has the jurisdiction (i.e., the power) to rule on the constitutionality of the coverage requirement. If only one thing was clear about the Justices’ view of the ACA after three days of oral arguments, it is that they do not see the AIA as a barrier to reaching the other (substantive) questions on which they granted certiorari. The Justices’ banter at oral arguments evidenced a willingness to brush aside the AIA issue to reach the merits of the case (of course, the possibility remains that enough of the Justices fear the prospect of deciding the politically charged question about the constitutionality of the coverage requirement in an election year and may decide to seek comfort in a non-partisan finding that the AIA prevents them from ruling; again, however, a taste for this approach was not on display during oral arguments). Assuming the Court dispatches the AIA question, the Court has a few options at its disposal, each of which was raised during oral argument by one party or another. One approach would be to rule that since Congress called the amount to be owed in the event that an individual refuses to comply with the minimum coverage requirement a “penalty” instead of a “tax”, Congress envisioned the ACA as being excluded from AIA applicability. A second approach available to the Court is to rule that the AIA can be waived by the courts as a matter of equity, because the law is not a total bar to hearing pre-assessed tax lawsuits. Interpreted this way, the AIA is designed to prevent individuals from bringing facial challenges against tax laws, rather than existing to prevent courts absolutely from hearing claims against pre-assessed taxes. A third approach the Court could entertain is to rule that the minimum coverage penalty is attached to a health care requirement, rather than being attached to a tax. Seen from this vantage point, the Court could decide that whether the AIA bars courts from hearing pre-assessed tax lawsuits or prevents individuals from lodging facial tax challenges is irrelevant, since there would be no AIA-covered tax to begin with. Whatever the approach, it seems likely that the Court will brush aside the AIA challenge to the ACA’s minimum coverage requirement. In the unlikely event that the Court does rule that the AIA applies, Congress could always amend the AIA (as it has many times over the years to include certain exceptions) to make clear that the ACA is not covered by the AIA. Joel Teitelbaum, JD, LLM is an Associate Professor and the Vice Chair of Academic Affairs in the Department of Health Policy at the George Washington University School of Public Health and Health Services. He also serves as Managing Director of the School’s Hirsh Health Law and Policy Program. Along with co-author Sara Wilensky, Professor Teitelbaum is the author of Essentials of Health Policy and Law from Jones & Bartlett Learning, which just last month published in a Second Edition. (Qualified instructors are invited to request review copies here.) Professors Teitelbaum and Wilensky are also the authors of an eChapter on Health Reform which may be bundled with any Jones & Bartlett Learning text at no additional cost.